Just in the past few months, hackers dropped a virus into hospitals’ computer systems, shutting them down. Then online bad guys penetrated HBO’s system, pilfering thousands of documents. A big part of the problem? In past years, companies did not invest enough in anti-hacking technology. That’s changing fast … which creates a big opportunity for investors. Gartner expects online security spending to rise 7% to $86 billion this year — and $93 billion next year. The IT research firm says companies now realize that security incidents cost them big. Plus, the internet cloud means they can buy protection services only the biggest companies could once afford. My takeaway is that a lot more small and medium-sized businesses will pony up large sums of money in the next 18 to 24 months for computer security. To do otherwise would leave their businesses even more exposed to hackers. One way to play this trend is to buy a broad-based fund, like the ETFMG Prime Cyber Security ETF (NYSE: HACK). I see bigger winners among specific companies in the computer security sector, which we’re starting to introduce onto the pages and portfolio of Total Wealth Insider. 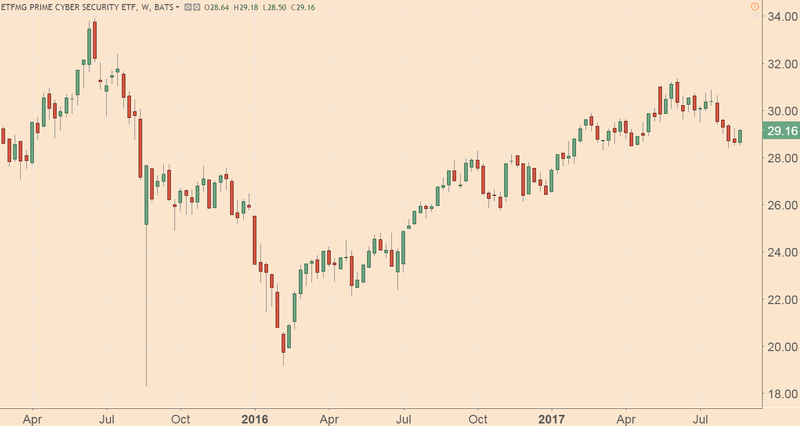 As you can tell from just a glance at the exchange-traded fund’s chart, the group went through its own euphoric bubble, and then a shakeout into 2016. Yet both Main Street businesses and corporate America demand more (and hopefully better) cybersecurity. Investors who buy into this sector will be riding the proverbial rising tide of spending as businesses invest big sums into security.